White paper on crime 2004 Part1/Chapter2/Section3/1. Fig. 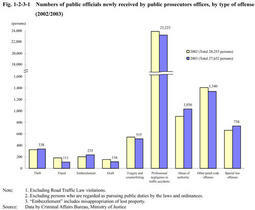 1-2-3-1 shows the number of public officials newly received by public prosecutors in2002and2003,by type of offense.In2003,received public officials decreased by601(2.1%)from2002to27,652.By type of offenses,professional negligence in traffic accidents accounted for the overwhelming majority,84.0%of the total. Fig. 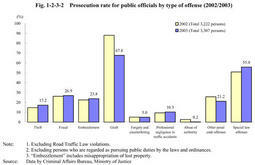 1-2-3-2 shows prosecution rate for public officials in2002and2003,by type of offense.In2003,3,307public officials were prosecuted,up85from2002,and prosecution rate was12.1%,up0.5points from2002.